Fence 25 was our second visit to La Charité, this time as part of the town's annual "Festival du Mot", where Fence members and writers performed plays from The Hopper Project, a response by four writers to the paintings of Edward Hopper. Denis Baronet (France) Zainabu Jallo (Nigeria), Sara Clifford (UK), and Andreas Flourakis (Greece) worked together on separate but interwoven plays under Denis' coordination to create theatre pieces which were then performed, in French, in the giant front windows of the Bazar Café, the Fence base in La Charité. All parts were acted by Fence members Denis Baronet, Fred Fortas, Morgane Lombard, Jonathan Meth and Natalie Rafale. 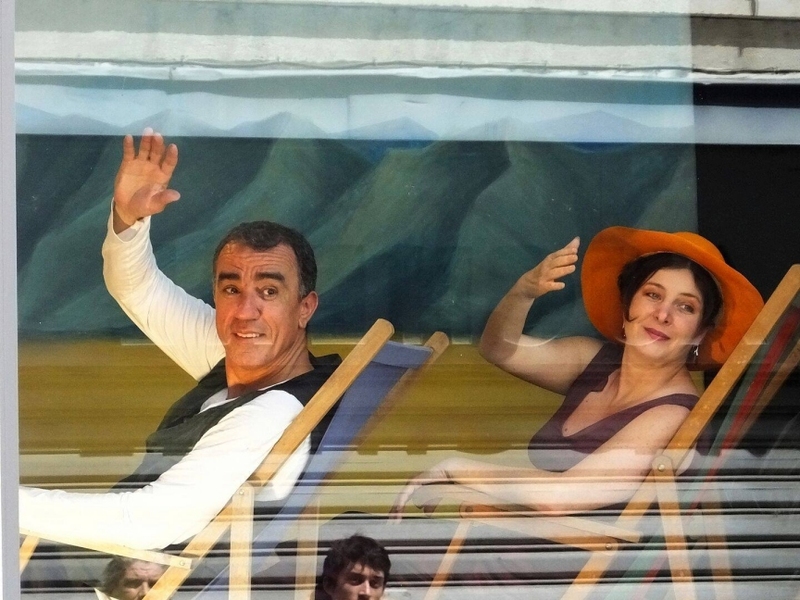 The shows were directed by Alain Foix, with set and sound by Bénédicte Lesfargues, and were performed in a series of episodes over several days and evenings to an enthusiastic audience seated in the street (kindly closed by the Mayor) directly in front of the café. Morgane Lombard in Zainabu Jallo's Intermission. Separately, in the context of the Festival du Mot, The Fence's Natalie Rafale performed her children's play Les Mots Qui Tombent du Ciel. The meeting also debated and made preliminary plans for the future of the Bazar Café space as a potential hub and writing retreat for Fence members. Since the meeting, the Café has met a crowd-funding target and is moving ahead with plans to open to the public.